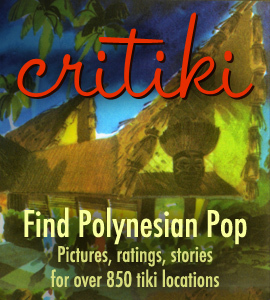 Art, Events, Tiki, Vancouver, B.C. The fourth annual New Tiny Tiki Lounge Group Show is happening at Lucky Red Gallery in Vancouver, B.C.’s Chinatown on December 9. Lucky Red is a tiny little speck of a gallery, and was formerly a one-car garage. Today it has been transformed into a tikified getaway, with bamboo and thatch — and of course art, with one-night-only shows. Artists for the show have not been announced (a call for artists went out just a couple days ago), but it’s likely that Vancouver-based tiki art superstar Heather Watts will be represented (above is her 2004 piece, The Gracious Host). For more details, visit 12midnite.com, the website of Lucky Red owner & curator, 12 Midnite. While you’re in the neighborhood, be sure to check out Funhouser Decor — they’re a great local source for your home tiki bar needs (it’s where the Tiki Bar TV gang shops). I just sent off my pieces for the show. Also included a few Tiki Chistmas stockings available for purchase at the show! Wish I could be there!